Our renewable energy products are ideal for a range of health-conscious and sustainability-conscious environments, including offices and workplaces! If the vast majority of your employees spend most of their day sitting down, they are greatly increasing their chances of developing diabetes or heart disease later on in life, as well as being generally unhealthy. Sitting still for long periods of time can also cause your employees to develop aches and pains which lessen their morale and cause them to lose focus at work, something which no employer wants! Although taking breaks to go for a walk is better than nothing, it’s not often practical or efficient for large numbers of your workforce to be frequently leaving their desks en masse. So, how can you promote good health in your employees without sacrificing efficiency and profit to do so? We create equipment which allows your employees to work in a healthier and more productive work environment, leading to greater satisfaction and morale. For example, we produce adjustable desks which can be used for sitting at or for standing at, allowing your employees to do some of their work while stood up. 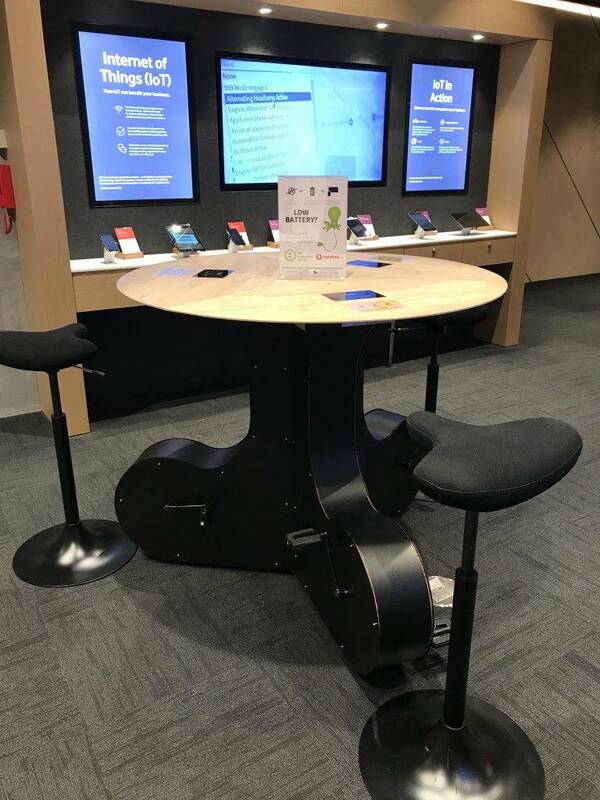 We also produce “bike tables” and “bike desks” which allow your employees to pedal while sitting down to work, with the kinetic energy they create being used to charge their phones and/or laptops, giving them something to work toward while simultaneously helping to lessen their carbon footprint. You don’t need to take our word for it – this has been shown to lead to positive results for employers. International studies have shown that active workplaces lead to higher levels of productivity, fewer insurance claims from workers, improved staff morale, lower staff turnover, and much more. Encouraging wellness programs for employees has been shown to have an ROI of roughly 3 to 1.2, making active workplace programs an ideal investment for employers. Eco Renewable Energy’s activity-based office equipment is also incredibly easy and convenient to install, using up the same (or similar) office space as your old-fashioned desks and tables did, meaning you needn’t sacrifice space in order to keep your workforce active. Workplace-based physical activity can increase productivity by 52% and reduce sick leave by 32%, making it a no-brainer decision for employers who want to promote workforce well-being and foster a cooperative environment in their workplace – one which also happens to be environmentally sustainable!